I remember the subject with dread when I think about my school years. I struggled and struggled to memorize endless lists of words for a test. Test day would come, I would fill in the blanks and promptly forget the words. Usually forever. As an adult, I wish I had retained more of the vocabulary learning that I had in my younger years. I now understand the importance and want my children to have the skills that I do not. The struggle I now face is how to teach the words without teaching the boredom that I felt as a student. Click here to see more examples of the cartoons. I handed James (fourth grade) the book and explained that he had one week to learn the words in each section. At the end of the week I would give him the test (located at the back of each section), plus quiz him orally on the words. I never actually saw James reading the book during the week. I frequently reminded him of the test and he would always answer, "I know. I know." I was pleasantly surprised on the first two Friday's that James did outstanding on the quizzes. The third and fourth times were not so great. When I asked James what was going on, he responded, "I liked the book at first, but then it just got boring." What about the book got boring? "Well, it just seemed like it got really predictable and I just got tired of reading it." I happen to think that this book offers a wonderful visual tool for learning vocabulary, but my approach in letting James complete the program on his own was maybe not the best for this particular program. Our usual vocabulary program is self-directed, and I guess that I was just hoping that this one could be approached in a similar manner. If we continue this program I am going to have to be more involved during the week. My complaints about the book are: #1 I didn't always think that the cartoons were appropriate. Why did the night scene include scary faces on the trees and shrubs, and an obviously scared child? That is not an idea I need to introduce in a house full of small children. #2 I felt that the cover of the book was misleading. My child didn't exactly learn a word a minute that he never forgot. It seems there may have been a better way to promote the benefits of the book without that statement. I encourage everyone to look into New Monic books to see if they are a right fit for your family. 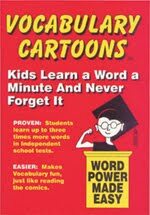 Besides Vocabulary Cartoons, New Monic also offers books designed to help young writers as well as SAT prep books for older students. They are very affordable (most are $12.95) and could be a perfect way to enhance the learning of your students. Click here for more information. Disclaimer: I received a copy of this book free of charge in exchange for my honest review on this blog. I received no other compensation.